The Bubble Lady delights children with her interactive show. The Joy Lok Family Resource Center's Holiday celebration took place on Saturday, December 16, 2017, at Gordon J. Lau Elementary School. The event began with children singing holiday songs to welcome families to the event. Children and families participated in carnival-style games such as reindeer ring toss, pin the nose of the showman, and a train ride. A face painter and balloon animal maker contributed to the entertainment, but the star of the show was The Bubble Lady. The Bubble Lady prepared an interactive show for all ages, delighting the crowd with dancing bubbles, trick bubbles, spaceship bubbles, bubble haircuts, dragon and whale bubbles, universe bubbles and people in bubbles, to name a few. A total of 168 children and 147 parents/caregivers attended the event and were treated to a brown bag lunch. 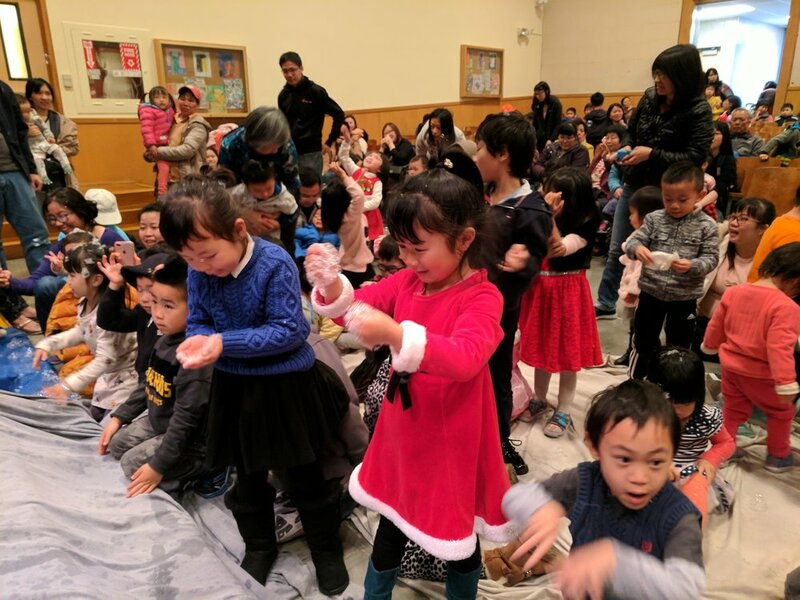 Each child was given a present that were donated by AT&Ts employee group, inspirASIAN, with toy donation efforts led by June Tom, Regional VP of San Francisco. Lena Yu, Joy Lok Manager said of the event, "We had tremendous turn out this year with many families celebrating with us for the first time. There was excitement and happiness all around."